Easy File Sharing Web Server is a file sharing software that allows visitors to upload/download files easily through a Web Browser (IE, Firefox, Chrome etc.). It can help you share files with your users, customers and partners. They can search for and download files from your computer or upload files from theirs. The files on your PC can be accessible from anywhere without special software. 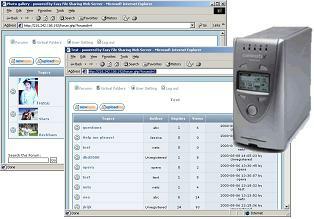 Easy File Sharing Web Server also provides a Bulletin Board System (Forum). It makes it easy for remote users to post messages and files to the forum. The Secure Edition adds support for SSL encryption that helps protect businesses against site spoofing and data corruption. please see Easy File Management Web Server. What's Easy File Sharing Web Server? Easy File Sharing Web Server contains several built-in systems including HTTP/HTTPS Web Server, multi-threads database system, Bulletin Board System, Server Script system, Password Protection system. Users just need to install Easy File Sharing Web Server and no other software. All without additional configuration. You may create a virtual folder from your hard disk; visitors may upload/download files to/from it. Easy File Sharing Web Server is much easier to use than a typical FTP server. It is also a web based file management solution that allows you to manage files on your web server just with a web browser instead of a FTP client, it also provides extended features which are impossible with FTP such as zipping and unzipping files. 256-Bit SSL (Security Socket Layer)support. Server level certificate creation. Instantly runs a complete web site on your PCs - does not need to install any HTTP Server such as IIS or Apache. Have built-in Database system, BBS system and integrated HTML/Script pages- does not need to know any HTML, ASP, PHP, CGI, ISAPI and other web technologies. Designed with security as a priority, Supports searching, downloading and uploading (much easier than FTP), securely. Complete customisation with templates, multiple styles available for the user to choose from. Unlimited forums and posts, unlimited members and unlimited upload file size. HTTP multi-thread downloading with resuming capability. Remote file management with a web browser. - Easy File Sharing Web Server 7.2 released. Update the built-in DB system with stable SQL DB system. Support iOS user to upload multiple photos/videos using browser(safari,chrome) directly. - Easy File Sharing Web Server 7.0 released. Disable the weak cipher in SSL/TLS. - Easy File Sharing Web Server 6.9 released. Add an option to force TLS for HTTPS. - Easy File Sharing Web Server 6.8 released. Fix a bug that Guest cannot upload files. Add an option to disable SSL v2.0. Force HTTPS(Redirect HTTP to HTTPS) with an option. - Easy File Sharing Web Server 6.7 released. Fix a bug that iOS app always get "fetch error". Add "Sort" menu for virtual folder list. - Easy File Sharing Web Server 6.6 released. Supports iOS app(Search "Easy File Sharing Web Server App" in App Store). Users can download and upload files/photos/videos easily with their iPhone/iPod touch/iPad. Add "Disable users to change user information" option. - Easy File Sharing Web Server 6.5 released. Supports user to drap and drop multiple files to upload in HTML5 supported browsers. Supports "remember password" option on login page. - Easy File Sharing Web Server 6.2 released. Support user to upload unlimited size file(a single file larger than 4 GB). Fixed a case insensitive problem of Active Direcotry users. Update the expired SSL Certificate. - Easy File Sharing Web Server 6.0 released. Fixed a bug that the server cannot be lauched automatically at Windows 7 startup. Support for installing service under Windows 7/Vista without "Run As Administrator". Support user to get external IP address from the program menu. - Easy File Sharing Web Server 5.8 released. Support the virtual folder list to be sorted by name. - Easy File Sharing Web Server 5.5 released. Integrated with Windows Active Directory to authenticate users via LDAP. Support 256 Bit(2048 bits) SSL (Security Socket Layer) certificate. - Easy File Sharing Web Server 5.2 released. Increase the download/upload speed of the server. Fixed a bug that user cannot download the file via SSL Server if the file is read-only. Update the certificate file of SSL Server. - Easy File Sharing Web Server 5.0 released. Users can select multiple files and folder to upload at a time. - Easy File Sharing Web Server 4.8 released. Add "Bind to a special IP address" feature. - Easy File Sharing Web Server 4.7 released. Add SSL(secure connection) support for SMTP server. Fix a bug when sending email in service mode. - Easy File Sharing Web Server 4.6 released. Forcing the File Download Dialog when user click the file link to download the file. Fix a bug that user cannot delete the files that have not been uploaded completely. Add a "secure login" link on the login page. - Easy File Sharing Web Server 4.5 released. Display upload progress bar when uploading a file. Support users to upload file from remote server directly. Support for restricting the file types that can be uploaded. - Easy File Sharing Web Server 4.2 released. Fix a bug that users cannot delete the uploaded files. - Easy File Sharing Web Server 4.1 released. - Easy File Sharing Web Server 4.0 released. - Easy File Sharing Web Server 3.3 released. Incorporating with Easy File Sharing FTP Server, it will let users download/upload multiple files and entire folders when they are in a virtual folder. Beep or wave notification when new user login. Fixed a bug about ssl speed limitation. Update openssl to version 0.9.7c. - Easy File Sharing Web Server 3.2 released. New registered user account can be created in Easy Chat Server automatically. Add a username column in the logs. Delete the files uploaded to the topic automatically when delete the topic. Right click on the user account list to send an email to all users. - Easy File Sharing Web Server 3.1 released. Incorporate with Easy Chat Server, it will let users log into chat rooms directly. Send notification email to specified email address when users register a new account. Send notification email to specified email address when users reply topics and upload files. Support for limiting max size of uploaded file. Support PKCS7 format certificate for SSL Server. - Easy File Sharing Web Server 3.0 released. Download/upload speed limitation support for guest. Support for changing thumbnail size. Support for displaying the files/folders in thumbnail view by default. - Easy File Sharing Web Server 2.8 released. Download/upload speed limitation support for users. Display the password as asterisks on user account panel. - Easy File Sharing Web Server 2.7 released. upload support for files larger than 4 GB. add a right-click menu to the forums/virtual folders list to change the sort order. - Easy File Sharing Web Server 2.6 released. download support for files larger than 4 GB. support for sending an email alert to all the authorized users when upload a file. - Easy File Sharing Web Server 2.5 released. Provide a Free Dynamic DNS Service for Dynamic IP address users. Add an option to disable the new user account until admin active it. Add a right-click menu to the users list to export/import all the user accounts. - Easy File Sharing Web Server 2.1 released. Add a search engine for virtual folders. Fixed a bug when send email, support more SMTP Authentication method. - Easy File Sharing Web Server 2.0 released. Add a Secure web server, support both http and https. Generating Server certificate and Certificate Signing Request for CA. - Easy File Sharing Web Server 1.25 released. support user to upload multiple files at a time. the most recently modified topic will jump to the top of the list. fixed a bug when the files can't be deleted if it remained in use. fixed a bug when browse with Mozilla Firefox. - Easy File Sharing Web Server 1.24 released. Remote Administrator can delete the files that were uploaded by other users. Switch the sort order of the file list between ascending and descending. Posting images by using the tag [IMG]imageURL[/IMG] in forums. Fixed a bug when open a Word/Excel file with IE6. disk quota for virtual folders. create new virtual folder automatically for new account. view online users on web page. remote admin (only user admin is available). flash the tray icon when new user login. - Easy File Sharing Web Server 1.23 released. new: enable the program to create sub-folders in virtual folders. new: hide forums from other users if they do not have permission to the forum. new: change how you view files in a folder, thumbnail or list/detail. new: sort files/folders by categories such as date, name, size and type. new: thumbnail generation for JPEG files when you browse the virtual folder. new: login to virtual folder by default. new: hide other user's virtual folder. new: detect links posted in messages and make them to be clickable. new: supports users to delete files they uploaded. fixed all the vulnerabilities, more security. fixed: fixed a vulnerability allows remote user to view the log files. fixed: fixed a vulnerability allows remote user to view the option.ini file. - Easy File Sharing Web Server 1.21 released. support uploading files to a forum thread. new: can be run as a Windows NT service. fixed several bugs, more security. fixed: Fixed security vulnerability (Directory Traversal Bugs). new: add/edit any file extensions icon. new: show gif/bmp files directly in forums. new: multi-thread downloading with resuming capability. new: hide system files and hidden files. - Easy File Sharing Web Server 1.2 released. - Easy File Sharing Web Server 1.0 released. the simple job of http file sharing so well. Thanks for making such a great product and for being so helpful! helpful you have been with resolving my issues, so he ordered a copy! Your software is GREAT! And your support seems even better! especially for the price! The interface is clean, simple, yet effective.